So I guess the question is, do you think you can learn from the trading diary of a professional trader? Well, before making a decision, keep reading this book review to get a detailed summary of Diary of a Professional Commodity Trader. In case you hadn’t heard of Peter Brandt, he’s been trading actively since about 1981.So with over 3 decades of experience in the markets, it’s hard to imagine that you wouldn’t be able to learn from his shares experiences in this book. But enough with the preamble, let’s get down to business. Diary of a Professional Commodity Trader is a great book. But it isn’t just a diary. The book goes above and beyond just a simple trading journal. So what should you expect? 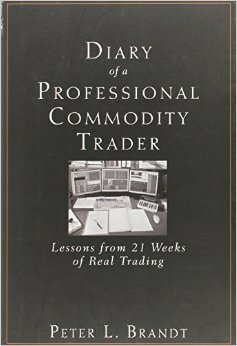 For starters, Diary of a Professional Commodity Trader begins by introducing Peter Brandt and how he got into trading. Then, it talks about his approach to the markets. He spends a lot of time introducing his classical charting approach and who his influences are. Even if you aren’t a commodity trader, these insights are still of valuable and entirely transferable to other markets. Peter goes on to share his specific entry criteria, stop loss and trailing stop system. I actually couldn’t believe the level of detail that the book shares regarding Brandt’s trading system. Even more impressive was how he openly discusses how he manages open trades and when he takes profits or stops out. The last 5 chapters of Diary of a Professional Commodity Trader share trade-by-trade exploits that take place from December 2008 – April 2009. It’s a wonderfully relevant and recent example of how contemporary commodity traders can profit in the market. Of course, the author then ties a bow on everything with a post-script summary and retrospective analysis on his transparent trading journal. It’s a great learning opportunity. ButI haven’t even talking about the best part yet. Diary of a Professional Commodity Trader isn’t just a trade journal or the discussion of a trading system. The author spends a lot of time sharing his best practice, especially as it pertains to trading psychology. He spends a lot of effort trying to communicate that the hardest part about trading is the upstream swim against human psychology. Trading successfully isn’t intuitive. But one of the best takeaways I got from this was that trade entry is the least important aspect of a trading system. Diary of a Professional Commodity Trader makes the point that even though most trading systems and traders are worried about finding the perfect entry; in fact, that should be the last of their worries. Trading success has much more to do with money management and emotional management than finding the perfect stock pick. Make sense? It’s a critical point and I think the book is oath reading solely for this reason. if I had one wish for Diary of a Professional Commodity Trader, it’s that the trading period covered was a little bit longer. I appreciate this may not have been feasible or realistic since the book needed to get to print. But 5 months feels like a very short window into the life of someone who has been trading for decades. Nonetheless, I guess I can’t fault this book too much if my biggest complaint is that I wish there were more of it, right? With that in mind, let’s wrap up this book review. Diary of a Professional Commodity Trader is a great trading book. And it will definitely be enjoyed by any traders who are looking to peel back the curtain and see the inner workings of a successful professional trader. It’s a perspective you aren’t likely to find anywhere else. And for that reason alone (plus all the others above), I recommend you buy Diary of a Professional Commodity Trader on Amazon if you’re a trader looking to get ahead in the markets. Of course, if you still want more information, you’re welcome to watch the video book review below for even more detail. This entry was posted in Stock Ideas and tagged investment book reviews on February 15, 2016 by Jworthy. In case you missed it, I recently did another book review of Michael Covel’s other book, Trend Following. I’m very happy I read both of these books around the same time. So if you’re interested in The Complete Turtle Trader you may want to check out Trend Following too. The Complete Turtle Trader is basically a story of applied trend following. If you’ve never heard of this book, you’re going to be amazed by the story behind it. And best of all, it’s all true! Curious yet? Great. Then let’s get into the details. I’m excited to tell you what The Complete Turtle Trader is all about. The Complete TurtleTrader is a fascinating true story about a bet between trend following traders William Eckhardt and Richard Dennis. Similar to the movie Trading Places, the two trend followers bet whether or not successful trading could be taught or if it was something you were born with. It was the ultimate nature vs. nurture debate, when it came to the world of trading. And The Complete Turtle Trader is the book that captures this story. It’s fascinating. The book then moves on to how Richard Dennis had the idea for the turtle competition with his colleague William Eckhardt. In detail, The Complete Turtle Trader reveals how the new trades (referred to as turtles) were identified, interviewed and hired. It explains how they were trained. In detail. From there, the book continues on over the course of the turtle experience. And the results are nothing short of astounding. Finally, the book wraps up by showing where the turtles are today. It’s a round trip in history’s greatest trend following experiment. I very much encourage you to check it out. 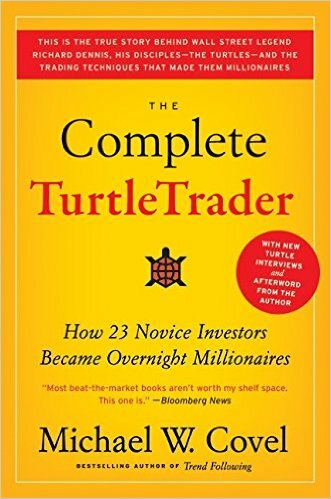 The Complete TurtleTrader was a great book. I had a tough time putting it down. But there was one part of the book that absolutely blew me away. In chapter 5 of The Complete Turtle Trader, Michael Covel actually reveals the exact trading systems that the turtles used to build their multi-million dollar fortunes. It seems like traders and investors are always looking for the best way to find stock trading ideas. And here, hiding in plain sight, is a proven system that consistently generated double-digit returns. For this reason alone, I would recommend that you buy The Complete TurtleTrader as soon as possible. In all the investment books I’ve read, nowhere else have I seen a detailed trading system like this that’s simple, straightforward, and they work! As was the case with my Trend Following book review, I am struggling to find something negative to say about The Complete Turtle Trader. Maybe you could argue the book is a short summary of a very detailed story. And I wouldn’t be complaining if it were a little bit longer. But if that’s the biggest problem with this book then I think I can give it two thumbs up. The Complete Turtle Trader is a wonderful book about how trend following can be applied. I seriously recommend that if you have any interest in technical trading you check out The Complete TurtleTrader on Amazon. Of course, if you want more information about The Complete Turtle Trader, you can also check out the video book review below. This entry was posted in Stock Ideas and tagged investment book reviews on February 14, 2016 by Jworthy.